This is a old saying from Jamaica and surely, there are similar saying in all the languages. For every action there is equal and opposite reaction aka Karma.Nothing happens by chance.Whatever you experience or happening in this life are the consequences of your actions from your past life which includes this life and countless previous lives. You don’t need to get angry at God or try to threaten God that I will not pray to you or why are you doing this to me, what have I done to deserve this etc. 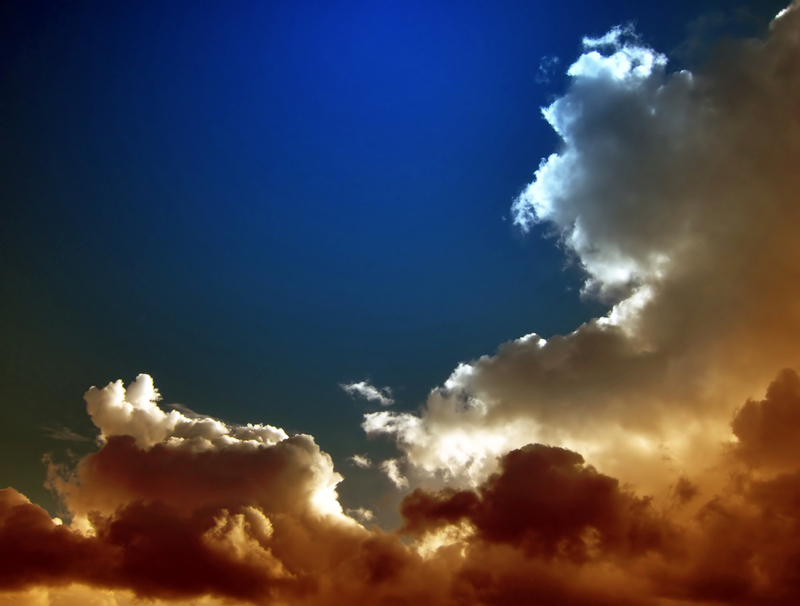 If you spit into the sky, the sky is not affected but, it is the person who spat gets it back. In the Canto 7 of Srimad Bhagavatam, we see that Prahlad a small boy of 5 years is harassed by his demoniac father in numerous ways. The reason was that he was worshiping Lord Narayana who Hiranyakashipu considered as his enemy. So he tried everything, to harm, kill the little boy by throwing him into a fire, a room full of snakes, boiling oil, throwing him from a cliff, walking elephants over him. And, what did Prahlad do?. He did not say – Oh God, why are you doing this to me.I am afterall your devotee ? I will stop praying you. He was totally undisturbed and brave, not resisting in any of the acts his father did on him. The Lord took personally care of him by saving him from all the inconveniences and dangers posed by his Hiranyakashipu. Similarly, in life we face bad things rather than questioning God, we need to question ourselves why this is happening. Treat others like the way you want to be treated. Definitely, it is not due to your Wife, Boss, friends back biting you. And generally, the tendency is that once you get used to this Habit of blaming others, sometimes those people can't or won't find anyone else to blame and then they turn to the unseen God. So who is to be blamed ?. The answer to this can be found in Srimad Bhagavatam, Canto 11, Chapter 23 The Song of the Avanti Brahmana which comes as a part of Lord Krishna’s Instructions to Uddhava called as Uddhava Gita. The brahmana who lost all his wealth, betrayed by family members, homeless and roaming as a beggar makes these famous statement “Neither mortal persons, the demigods, the soul, the ruling planets, the reactions of work nor time are the causes of one’s happiness and distress. Rather, the mind alone is their cause, because it is the mind that makes the spirit soul wander in the cycle of material life. The real purpose of all charity, religiosity and so forth is to bring the mind under control. A person who has already composed his mind in meditation has no need for these other processes, and for a person who is incapable of fixing his mind they are of no practical use”. Thus, the Avanti Brahmana became sober by developing a spirit of detachment and became a mendicant and spent his life roaming the world chanting the glories of God. with fruits relieves hunger and nourishes. "Purple is the color of good judgment. It is the color of people seeking spiritual fulfillment. It is said if you surround yourself with purple you will have peace of mind. 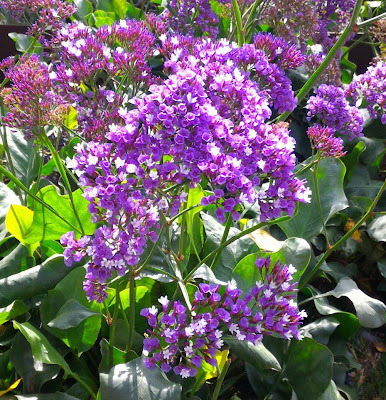 Purple is a good color to use in meditation.Purple has been used to symbolize magic and mystery, as well as royalty. Being the combination of red and blue, the warmest and coolest colors, purple is believed to be the ideal color. Most children love the color purple. Purple is the color most favored by artists. Thursday's color is purple." There is a beautiful sanskrit prayer towards mother earth advised by our elders to chant as first thing in the morning(along with few others), as you get up from your bed and before you put your feet on the ground. (which helps one start their day with feelings of gratitude, thankfulness and positive emotions). Vishnupatni Namastubhyam, Paada Sparsham Kshamasva Me. Oh ! Mother Earth, who has the ocean as clothes and mountains and forests on her body, who is the wife of Lord Vishnu, I bow to you. Please forgive me for touching you with my feet." Labels: Gratitude, Positive Vibrations, Prayers to Mother Earth, Purple Color, Purple Flowers. Happy Hanuman Jayanti (The day of Birth of Hanuman)to you. I came to know about this only today morning and was bit disappointed because, I was writing this article to be posted today and totally forgot about it. Ever since childhood, I used to be a great fan of Hanuman and used to love or read about Hanuma, the wonderful, superhuman feats he performed etc.And, as a child my father would make me read Hanuman Chalisa and Hanuman dandakam. Also, it was a great assurance to always remember Hanuman because at that age, I understood Hanuman is famou for killing the Rakshasas and all those silly Ghosts,scary things would not even dare to come near you (If you have the blessings of Hanuman).Then, after that Hanuman still continued to inspire me for his whole hearted devotion to Lord Rama and so much so that, Hanuman wanted to live as long as the universe existed so that he may continue to pray and worship Lord Ram.That's why he is called Chiranjeevi - one who lives forever. 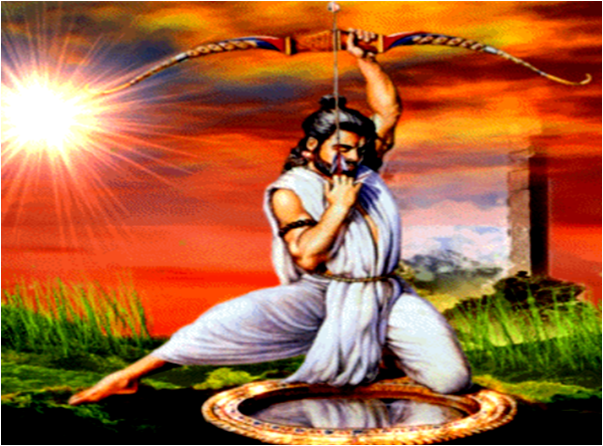 Having bowed to Sri Rama, Vayu’s son Hanumantha yearning to fly over ocean, stepped on the Mahendra mountain and took off.He also indicates that he is not doing a favor but doing a service to Sri Rama who is Supreme Lord Possessor of 16 auspicious qualities, infinite valor and strength and is super-efficient.Flight is easier only when one holds his breath. By using the word “pavanasya soonuH” he has told that now the person flying is wind God himself who controls everybody’s breathing. When Hanumantha pressed his legs on Mandara Mountain in order to fly, due to the force with which he pressed, the mountain sunk into the earth.This also indicates that Ocean of Water is no challenge to messenger of Shri Rama who is the Ocean of good virtues. By suppressing Mahendra Mountain Hanumantha has indicated that he is Vayu Deva who is greater than Mahendra and other Demigods.Suppression of Mahendra Mountain is also indicative of defeating Indrajit incident in the near future. The ocean became agitated due to the force of pull by Hanuman’s strength.ocean started following him along with creatures living within. Trees on the mountain were pulled by the force of his speed and started following him too. Mainaka mountain which was thrown by Vayu God into the ocean rose up for him. 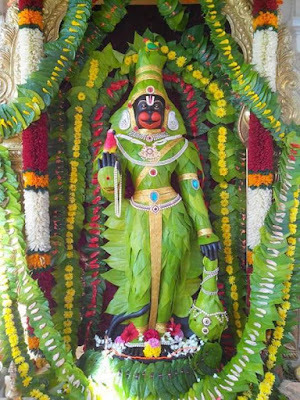 Even the Realizing that there was no place to stop on the ocean which was spread over 100 yojanas,Mainaka mountain offered Hanuman to take rest.Hanumantha who did not know exhaustion did not wish to take rest. How can a person of infinite strength and virility be fatigued? He embraced Mainaka and continued his journey….. Suppose you tell this to your children, don't worry about anything. Keep playing, dont need to take bath, washing your hands or going to bed.You can break things, throw your toys everywhere in the house and by the way hit and hurt someone, after all you are small and you dont really mean it.And, also dont worry about having you breakfast, lunch or dinner.Just eat and sleep whenever you want.How does this sound?.You would say "Pure Insanity or craziness ? ".True, children not only need to be given love and affection, protection but, a proper guidance, discipline, some rules and regulations, so that they don't go over the top or blow things, hurt themselves. We have to give them enough freedom under guidance so that they develop right values and Character. Well that is about children but,it is said that our mind is like a child which is rebellious,hard to control,constantly blabbering like a child,demanding things, not letting us to focus on things that we want to do. Infact,in the Chapter 6 of Bhagavad Gita, Arjuna the greatest of warrior confided to Lord Krishna in Bhagavad Gita that the mind is restless, Obstinate,turbulent and very strong and to control the mind is more difficult than controlling the wind.And, Lord Krishna acknowledges this fact and says that it is undoubtedly difficult to control the Mind but,it is possible by suitable practice and developing vairagya - detachment.The detachment Lord Krishna is talking here is the detachment from the matter and engaging it in the spirit.Firstly, the vedic scriptures advise us that to satisfy minds desire's is life adding the fuel to a raging fire. When some fuel is added to the fire, for a short while the fire seems to have subsided but, within no time comes back with greater force and proportion. Similarly, when we listen to our mind and try to satisfy our desires through material things like, latest Mobile, latest dress or by gratifying our senses and over indulging in things like excess food, drinks or other sensations, we seem to get a temporary relief for the time being, only to see them come back with more force.We need use our intelligence to make the distinction and right choice of things we need and desires we want to fulfil.Another aspect of trying to listen to mind's desire is that, if the desire is not fulfilled, that will actually lead to anger, restlessness and wrath.And, if the desire is fulfilled, then we want more and more of that particular sensation which develops into propensities like lust, anger and greed. Thus, it helps us to become cool headed and act with our intelligence rather than dance to the whims and fancies of the child like mind.As Lord Krishna explained to Arjuna, we need to take up suitable practices for controlling the mind.Some of the suitable mind control techniques available are like Self Hypnosis, NLP - Nuero Linguistic Programming, Meditation,Healing, Pranayama, Yoga which are good to elevate from the gross to subtle realms or spheres of life.However, I found the practice of Mantra Meditation " Hare Krishna Hare Krishna Krishna Krishna Hare Hare, Hare Rama Hare Rama Rama Rama Hare Hare" is the most practical and suitable method of controlling your mind, which is only the begining and there are many more benefits to follow.The other aspect of what Lord Krishna said - develop detachment, I found is achieved by reading and listening to the sacred texts like, Bhagavad Gita and Bhagavatham from realised Souls like His Divine Grace Srila Prabhupada and his disciples. As explained in Bhagavatam, as soon as one starts listening to the sacred narrations and chanting the names of God, he automatically develops detachment and also control of mind.Just like a person having meals with every morsel of food that he takes he feels satisfaction and gets strength. Finally, my thoughts are that one experiences real freedom when he has control of senses, one who can control what he speaks, what he eats etc.The first step to control the senses is to control the mind, which purifies our consciousness and senses.One of the easiest way to control the mind and senses is engage them in service of the Master of senses "Hrishikena hrishikesha-sevanam bhaktir ucyate".Hrishikesha is another name for Lord Krishna.Engaging our senses in service of God or Krishna is basically called as devotional service where the centre of ones life is not himself but the Supreme God. Today is a special and auspicious day. The appearance day of Lord Sri Rama which is celebrated as a grand festival by many people in India and all over the world. Sri Ramanavami occurs in April-(the Shukla Paksha on the Navami, the ninth day of the month of Chaitra in the Hindu calendar) the birthday of Sri Rama and his marriage to Sita Devi which was also took place on his birthday. The following is an excerpt from the Valmiki Ramayana – Bala Kanda that I tried to put in my words. “In this present world, is there a person who is Righteous,Truthful,Honourable, Magnanimous, a scholar, Unwavering in his deeds, Capable, skillful,Courageous, who could control his fury, who is of a noble, benevolent, effulgent, non-envious nature and feared even by Demi-gods when provoked to war.? Please tell me about such a person, if he exists ?”. And, Narada replied that “ Oh Sage Valmiki, all these qualities you mentioned are impossible ones to find out in any human beings. But, however there is a person in this planet earth who is not only extolled with all the wonderful qualities you mentioned but, numerous others as well”. 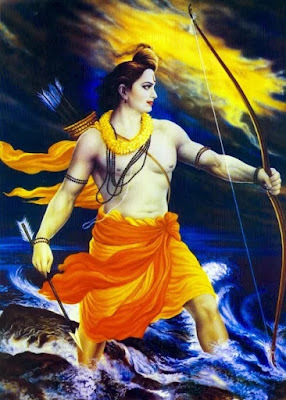 “Rama is equal to Brahma, grave like a ocean, Courage as huge as a Himalayan Mountain, Valorous like Vishnu and soothing like a full moon, has patience like Mother earth and Anger like a Inferno, Charity like the Demigod of riches Kubera and in matters of truth like a God of Dharma ”. This is a story is from Ramayana that heard.After the war with Ravana and Rama returned victorious to Ayodhya with Sita Devi,Lakshman and all his army of Monkeys and bears. Lord Ram was coronated as the King and it was a happy and joyful occasion for everyone. One day there was a invitation from Janak Maharaj, King of Mithila inviting everyone to come and stay for sometime and of course there will be a big feast – Huge Lunch etc. All the monkeys are immediately got excited and wanted to go with Rama to his father in-law's place for the wonderful feast and hospitality that he promised. Lord Ram was hesitant to go, especially with all his monkey army because, after all monkeys are monkeys except few like Hanuman, Angada, Sugriva etc. But all the monkey soldiers immediately pleaded with Ram. Master please let us come with you. We promise you that we will be well behaved and cause no trouble to your reputation nor any inconvenience your father-in law and other relatives.And, then assured him. Look, you and everyone else know how wise and well behaved is our minister Jambavan (the Bear) is. We will all simply follow him and do whatever he does.That way, one can't go wrong. 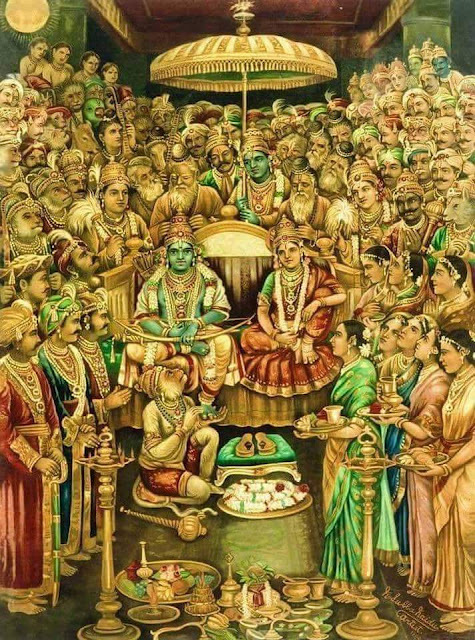 Lord Ram of course who is very magnanimous in heart agreed for this and one the given day Lord Rama and the whole entourage set off to Mithila. Upon arrival and after exchange of pleasantries, the much awaited lunch feast was served.The monkey and bear soldiers were seated in a huge palace and the food was served. As a part of the menu, fruits including a ripe mango and other items were served to everyone. Now everyone was watching Jambavan trying to act, behave exactly like him. During the course of lunch, Jambavan happened to pick up the soft, juicy mango fruit and before he can eat it, the fruit popped open because of the pressure he applied and the large seed inside the fruit rocketed out into the air. Jambavan was shocked and embarrassed by this sudden mishap and quickly jumped up a little bit from his seat, caught hold of the seed before it landed on others plate or floor. Of course all the monkeys watching Jambavan with rapt attention and to be true to their word to Ram started following Jambavan act. Everyone started pressing the mango fruits with their full power and of course there was competition about who is doing it better. Some monkeys jumped few feet, others to the ceiling, others to the windows, other went all the way to the top of the palace and came back. There was the seeds of mangos being thrown everywhere, monkeys jumping, things flying out in all directions. This must have been one of the most chaotic lunch feast ever. So friends, this is what happens when one blindly follows other. That is why, blind following is condemned. Thus before following anyone or any philosophy, one needs to use their mind, intelligence and reasoning. The Vedic tradition has an internal check system of truth validation. Guru (spiritual master), sastra (revealed scripture) and sadhu (holy persons) must be in harmony and then an issue can be accepted as verified. Wonder what does One-pointed attention means ?. It is giving full concentration to the desired goal, job or an issue. a stuffed bird placed on a tree at a distance and asks them what they are seeing. "What can you see Duryodhana"? asked Drona. I can see the wall, the tree and the stuffed Bird placed on the tree. Next, "What can you see Yudhistira"? asked Drona. I can see the tree and the Bird on the tree. Next" What can you see Arjuna"? asked Drona. Arjuna took the aim and said "I can see only the eye of the Bird". Arjuna's arrow pierced the eye of the stuffed bird with exact precision.Drona was happy and with jubilation proclaimed that Arjuna is going to be the greatest archer in the history of Mahabharat.Infact this is the same technique that he used to shoot the target during the Svayamvara of Draupadi.And, Arjuna went on to become a greatest archer by practicing in the night and by blindfolding himself for which, he was called Gudakesh - one who conquered sleep. 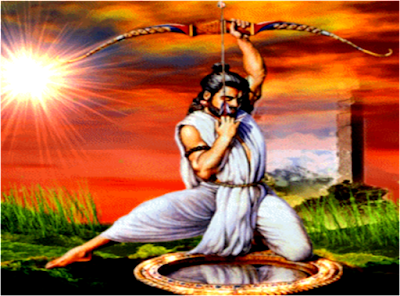 He is also ambidextrous,being able to shoot the arrows with both hands for which he was called Savyasachi.When I was young and when there was thunder and lightning, my grandmother used to repeat the names of Arjuna like - Arjuna,Phalguna, Kiriti,Savyasachi because, she told me that just by taking out the names of Arjuna - there won't be a lightning strike i, e even they are afraid of him and they would change the location of their striking. Arjun went to higher realms of the world like Deva Loka and met Indra the king of Demigods and obtained powerful, celestial weapons which he will use in the great Mahabharata war. Here are some of the other names of this great warrior. Shwetavahana - one with white horses mounted to his chariot given to him by Agni. Paartha - son of Pritha, another name for Kunti. Kapi Dhwaja - Having flag of Kapi (monkey - Hanuman) on his chariot. Parantapa - one who concentrates the most, destroyer of enemies. Gandivdhanava - one who possesses the mighty bow - Gandiva given by Agni. How many times we fail to see our main goal of life like the eye of the bird and get carried away by the surrounding things like the treee, branches,bird, clouds in the sky, the sun etc. To achieve anything significant in life, What is required is the concentration,determination, a firm resolution, focus on the desired goal.Otherwise there is no success.These days multi taking is such a common thing that at any point of time, people are doing more than two things. A simple example, watching TV, talking on phone, eating while keeping the feet on foot massage machine.All these things looks trivial and harmless but, when we look from the spiritual and well being perspective, one should honor the food such that, one should not talk while eating. Then ofcourse, everyone knows that eating while watching TV makes one a Couch potato,one tends to eat more and so many health problems.Feet massage ? there is a gulf of difference in consciously feeling the feet getting massaged rather than absent mindedly doing it.I mean, this si a simple example to prove a point but, it doesent mean that when are driving a car, you cant hear to music or play radio but, ofcourse you dont talk on your mobile or send text messages - anything that takes away your attention. One more practical thing is that rather than trying to do multiple things at one time,divide the work into small chunks and do things one by one.